web promotion of its 2014 awards luncheon. 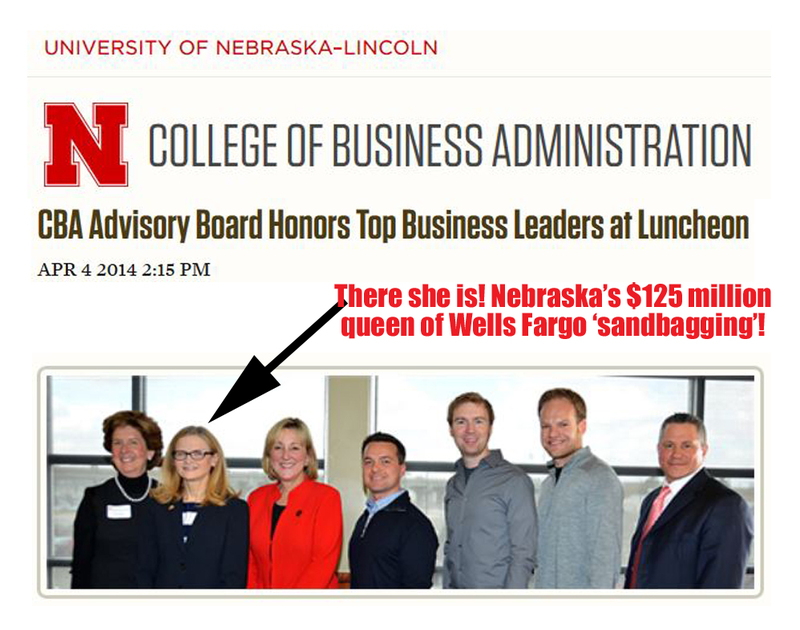 In 2014 the University of Nebraska College of Business Administration honored Nebraskan Carrie Tolstedt with a Lifetime Achievement Award. Tolstedt was in charge of community banking at Wells Fargo, supervising 94,000 people who worked in retail banking. 5300 of them were fired for opening "ghost" accounts under the names of about 2,000,000 Wells Fargo customers without their knowledge or consent from 2011 to 2015. Tolstedt knew about the widespread fraud in her division (prompted by killer cross-selling quotas) since 2013. The unauthorized accounts cost Wells Fargo customers $2.6 million in fees and prompted overdraft charges in some cases. The added credit cards damaged the credit ratings of Wells Fargo customers. She departs Wells Fargo with a golden parachute of up to $125,000,000 plus year end 2016 bonus, pending the levying of any "clawback" approved by the Wells Fargo Board. These six business leaders and the corporation we honored today are inspiring to all of us,” said Plowman. “Each of them lift us up and inspire us to start something. Well, Dr. Plowman, we certainly agree with you that Tolstedt started something. As for you, we hope you're inspired to speak sentences in which the verbs agree with their subject, i.e., "Each of them lifts us up and inspires us..."
Nelnet operates in four business segments and adheres to a strong set of customer and community-centric values. In February 2007, New York Attorney General Andrew Cuomo launched an investigation into alleged deceptive lending practices by student loan providers, including The College Board, EduCap, Nelnet, Citibank, and Sallie Mae. The New York Times reported in August 2007 that Jon Bruning, Nebraska Attorney General, allowed Nelnet to be forgiven the $1 million settlement the company reached with Bruning in April 2007. Nelnet was accused of industry wide kickbacks, improper inducements, and gifts from student loan providers to colleges and universities. Nelnet agreed to provide $1 million to the state in support of a national financial aid awareness campaign. Bruning decided in August 2007 to forgive Nelnet its $1 million obligation after the company announced that it had reached a separate $2 million settlement with New York State Attorney General Andrew Cuomo. Nelnet has also made financial contributions to United States congressional campaigns, including a contribution from Nelnet and Union Bank & Trust Company of $16,100 to Jon Bruning, Nebraska Attorney General, for his Senate election campaign. A United States Department of Education audit revealed that from 1993 to 2007, Nelnet had utilized a loophole in federal tax legislation that allowed the company to receive a higher interest rate on specified loans, generating $278 million from taxpayers. Nelnet disputed the findings of the audit through a letter written to the United States Department of Education letting them know of this loophole, and ultimately, U.S. Department of Education ruled that Nelnet would keep the $278 million. The Chronicle of Higher Education reported in August 2010, that Nelnet settled a case for $55 million. The suit was filed by a former Department of Education researcher named Dr. Jon Oberg. Nelnet and other lenders were accused of defrauding taxpayers of billions of dollars in student loan subsidies. The largest student lender in the country, Sallie Mae, is also listed as a defendant in the case. In America, we have faith that when we open up a checking account, we aren’t opening ourselves up to being scammed. Whether you use a local credit union or community bank or one of the big national chains, we take it for granted that those institutions are fulfilling this basic responsibility to their consumers. That’s why I was deeply disturbed when, last week, we found out that Wells Fargo had engaged in widespread illegal practices over many years. The bank secretly opened up millions of accounts for customers without their consent – betraying their customers, misusing their personal information and leading many to be slapped with unjust fees and other charges. Today, Wells Fargo’s CEO will appear before Congress. He owes all of you a clear explanation as to how this happened under his watch. There is simply no place for this kind of outrageous behavior in America. Our economy depends on a strong and safe banking system to help keep it moving. But even after Americans spent years working hard to recover from the Great Recession, the culture of misconduct and recklessness that preceded that crisis too often persists. I have a plan to address it. First, we need to defend the Consumer Financial Protection Bureau. The unfair and abusive practices at Wells Fargo remind us that we need tough watchdogs looking out for customers. The CFPB worked with local authorities and enforced the law – assessing its highest penalty ever, and bringing the bank’s illegal activity into the national spotlight. Donald Trump, the Republican Party, and Wall Street lobbyists are desperate to dismantle this effective agency, which is dedicated solely to protecting consumers from unfair and deceptive practices. I won’t let them put the CFPB under their thumb. I’ll protect the CFPB and make sure it can continue its essential work on behalf of the American people. Second, we need real consequences when firms on Wall Street break the law. This past week, we learned that one of the Wells Fargo executives that oversaw the division that ripped off its customers left the bank – not with a pink slip, but with a $125 million payout. It’s hard to imagine that top executives were unaware of a problem that involved thousands of the firm’s employees. After all, they imposed sales targets and compensation incentives in ways that led to this behavior. And it’s frustrating that a bank can simply pay a fine and keep doing business as usual – with massive compensation for the executives responsible. That compensation should be clawed back. I’ve put forward an agenda to enhance accountability on Wall Street. Executives should be held individually accountable when rampant illegal activity happens on their watch. Their compensation should take a hit if their companies pay major fines. And they must face appropriate legal consequences if they break the law. Third, we need to make sure that no financial institution is too big to manage. I’ll put additional safeguards in place to address the risks that the big banks continue to pose to our system. And if any bank can’t be managed effectively, it should be broken up. I’ll appoint regulators who will stand with taxpayers and consumers, not with big banks and their friends in Congress. 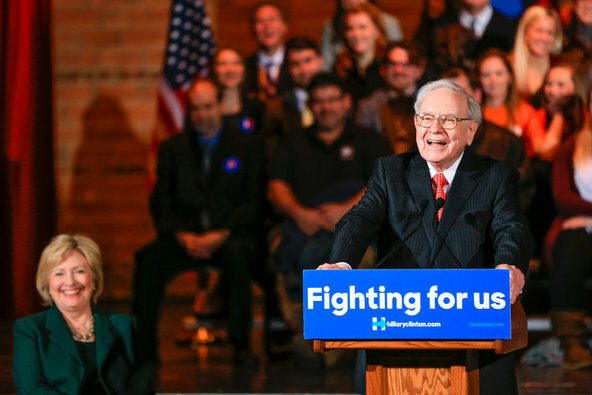 I’ll fight hard to make sure that Wall Street is working for Main Street – not the other way around. We need to keep pushing to make the financial system safer and fairer. Let’s do it together.